BELLIN - L'Isle Formose et parties des Costes de la Chine..
BELLIN, J.N. - L'Isle Formose et parties des Costes de la Chine..
L'Isle Formose et parties des Costes de la Chine.. - BELLIN, J.N. Size : 9.2 x 11.2 inches. / 23.4 x 28.5 cm. Description :This well-known map of Taiwan is prepared by Jacques Nicolas Bellin and was based on Jesuit information. The text along the island's east-coast claims: Of this coast little is known . The map is also showing part of the coast of China and the Island of Magong. The map marks the ruines of Fort Zeelandia as well as the fort at Keelung. The east coast still has the river that separates a section of the land from the island proper. Down in the Anping area we find the words Taiouan or Taivan. 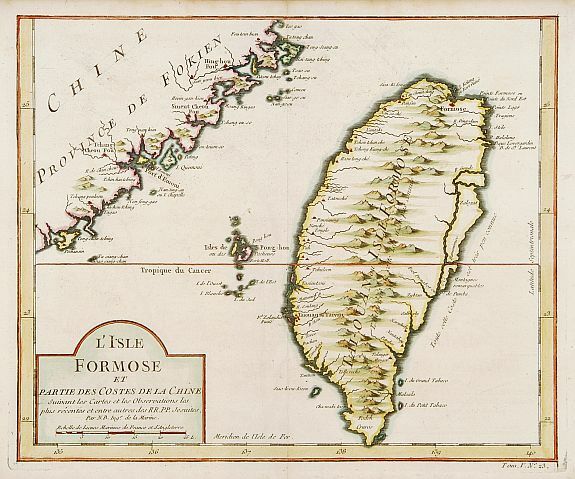 Through the island is called Formosa, this is the first time we see the word Taiwan (Taivan° on a map. Bellin was appointed hydrographer (chief cartographer) to the French Navy upon the creation of France's hydrographic office, the Dépôt des cartes et plans de la Marine. Over a 50 year career, he produced a large number of maps and charts. The accuracy of Bellin's charts ensured that they were in use for many years. The mapping of Taiwan, pp. 76,77.